This week is your last chance to try a free Irish dance class in Lexington before registration for our fall classes opens on August 24. 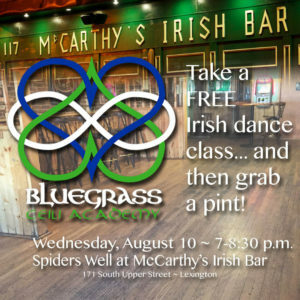 Every month, we offer a night of dancing — and fun — at the Spiders Well at McCarthy’s Irish Bar. You can join us downtown this month on Wednesday, August 10 from 7 – 8:30 p.m. 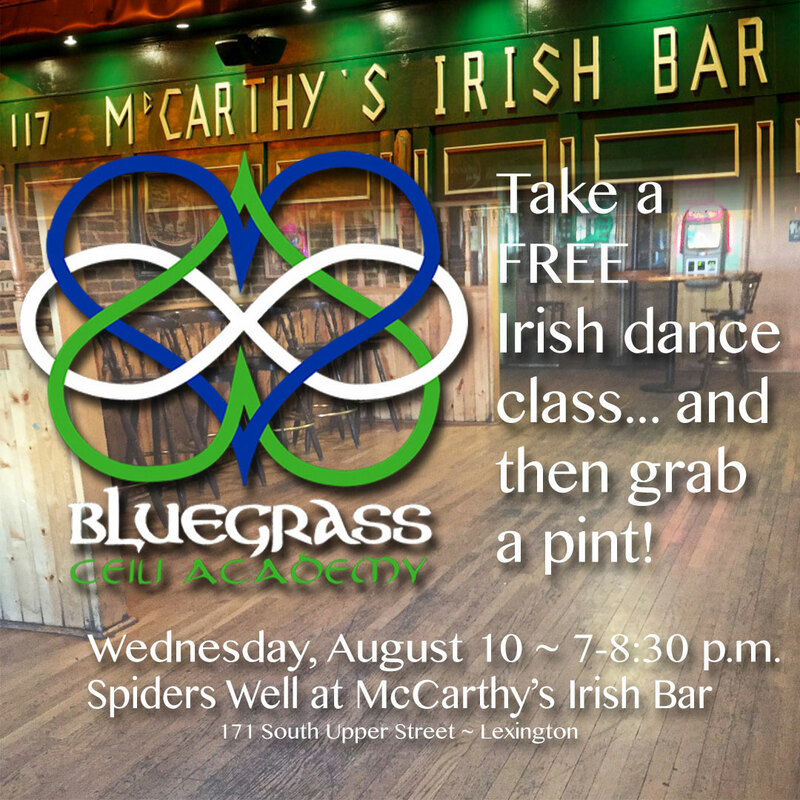 Starting in September, Bluegrass Ceili Academy will be offering weekly Irish dance classes in Lexington through Artworks at the Carver School, an arts and cultural program from Lexington’s Parks and Recreation. Our regular weekly classes will focus on the basic techniques of Irish dance, emphasizing group — or ceili — dancing. Specific instruction includes standard ceili dances and original choreographies for performance. New to Irish dance… or even to dancing? Not to worry! No previous dance experience is necessary, though students with previous experience are welcome. Registration for our Irish dance class in Lexington opens August 24 through the Lexington Parks & Recreation Online Registration System. Our Fall session runs from September 26 to December 5 and costs $60. Our Spring session of Irish dance classes in Lexington picks back up January 30 through April 17 and runs $70.